Art of Black: Ebony G. Patterson...while the dew is still on the roses...presents the work of Kingston-born artist Ebony G. Patterson (b. 1981). The most significant presentation of the artists work to date, the project includes examples of the artists work produced over the last five years, embedded within a new installation environment that references a night garden. 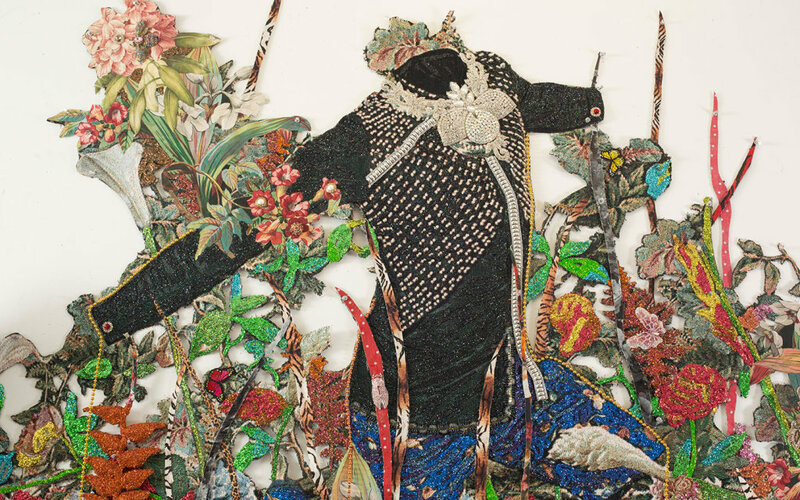 Known for her drawings, tapestries, videos, sculptures and installations that involve surfaces layered with flowers, glitter, lace and beads, Pattersons works investigate forms of embellishment as they relate to youth culture within disenfranchised communities. Her neo-baroque works address violence, masculinity, bling, visibility and invisibility within the post-colonial context of her native Jamaica and within black youth culture globally. This exhibition focuses on the role that gardens have played in her practice, referenced as spaces of both beauty and burial; environments filled with fleeting aesthetics and mourning.